Ischemic preconditioning (IP) is a well-established phenomenon, and the underlying mechanisms of IP are thought to involve adaptive changes within the injured tissue. Because one of the main functions of immune cells is to harbor memory, we hypothesized that circulating immune cells could mediate IP by responding to an initial ischemia reperfusion injury (IRI) and then mediate decreased injury after a second IRI event. C57BL/6 mice underwent 30 min of bilateral renal clamping or sham operation. At 5 days after ischemia, purified leukocytes from spleen were adoptively transferred into T cell-deficient (nu/nu) mice. After 1 wk, these mice underwent 30 min of renal IRI. The nu/nu mice receiving leukocytes from ischemic wild-type mice had significantly reduced renal injury compared with nu/nu mice receiving leukocytes from sham-operated, wild-type mice. Infiltration of neutrophil and macrophage in postischemic kidney did not correlate with the protection. No difference in kidney C3d or IgG deposition was detected between groups. 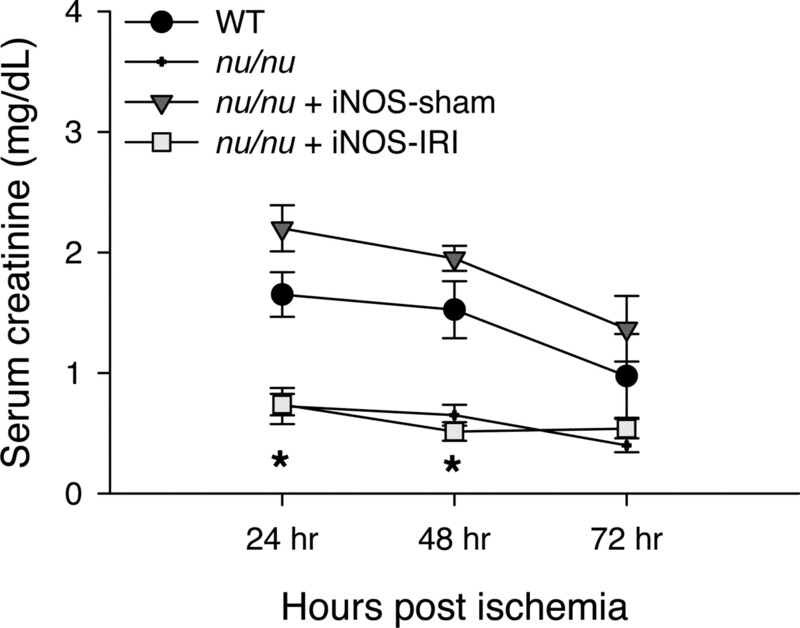 Given that inducible NO synthase (iNOS) has been implicated in IP, leukocytes from ischemic or sham-operated, iNOS-deficient mice were transferred into nu/nu mice. Effects similar to those of wild-type transfer of ischemic leukocytes were demonstrated; thus, iNOS was not mediating the IP effect of leukocytes. This is the first evidence that immune cells are primed after renal IRI and thereby lose the capacity to cause kidney injury during a second episode of IRI. This finding may also be relevant for elucidating the mechanisms underlying cross-talk between injured kidney and distant organs. Ischemic preconditioning (IP)3 is a well-established phenomenon that occurs when ischemic injury renders an organ resistant to a subsequent ischemic insult. Ischemic injury to the kidney is known to be associated with high morbidity and mortality. IP in the kidney is well established, and resistance afforded by 30 min of bilateral kidney ischemia persists for up to 12 wk after preconditioning (1). There have been a number of possible explanations for IP in the kidney. Proteins that protect the cell, such as 25-kDa heat shock protein, have been implicated in the process (2). Other key players in preconditioning are adenosine and adenosine A1 and A2a receptor agonists (3, 4). The role of NO has also been demonstrated to be important in preconditioning (5), possibly by blocking leukocyte retention and the deleterious effects of activated leukocytes on glomerular and tubular function (6). A recent study has indicated that inducible NO synthase (iNOS) may be responsible for a significant component of the long-term protection afforded the kidney by IP (1). The identification of the mechanisms involved in IP are important for both understanding the pathophysiology of ischemic injury and discovering therapeutic strategies. Immune cells are now established to be important mediators of renal ischemia reperfusion injury (IRI) (7); however, there have been no studies to investigate their involvement in IP in the kidney. Some have suggested that a decrease in leukocyte-endothelial interaction confers protection in the preconditioned kidney (8). This could be due to a number of factors, including a decrease in immune cell infiltration or a decrease in immune-mediated cytokines and chemokines. For this study we hypothesized that circulating immune cells could mediate IP by responding to an initial ischemic event and then mediating decreased tissue injury after a second ischemic event. To test this hypothesis, we initially established an IP model in mice. After confirming the IP effect, we transferred immune cells from ischemic and sham-operated mice into T cell-deficient (nu/nu) mice that then underwent an episode of ischemic injury. We found that T cell-deficient mice that received leukocytes from mice that had undergone an ischemic period 5 days before death had a reduced amount of injury compared with T cell-deficient mice that received leukocytes from sham-operated mice. Given the putative role for iNOS in IP, we tested whether leukocyte iNOS played a role in this immune preconditioning by transferring iNOS-deficient mouse leukocytes after renal IRI into T cell-deficient mice. 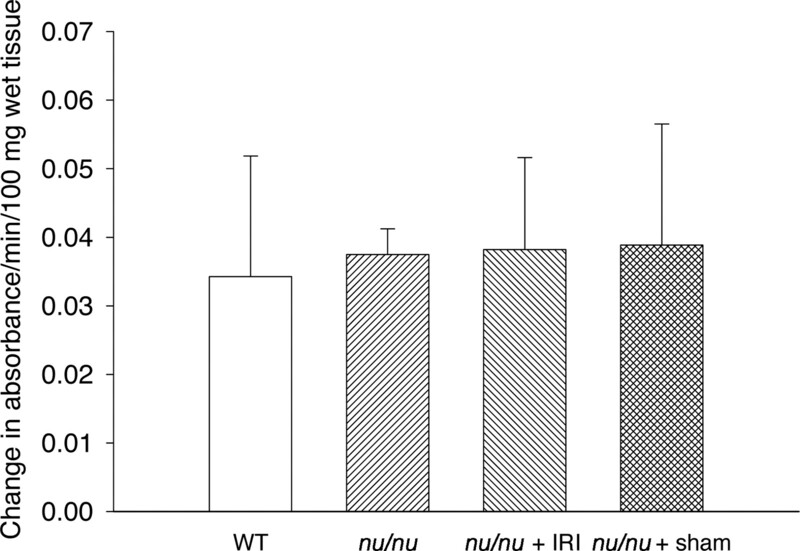 We found that iNOS deficiency did not alter the protective effect of immune-mediated IP. This is the first demonstration that immune cells are mediators of an IP response. T cell-deficient mice (B6.Cg-Foxn1nu/J), iNOS-deficient mice (B6.129P2-Nos2tm1Lau/J), as well as C57BL/6 wild-type (WT) littermates were purchased from The Jackson Laboratory. Mice were housed under pathogen-free conditions according to National Institutes of Health guidelines. To confirm knockout and adoptive transfer status, spleens were collected from mice at death and analyzed for T cell populations using flow cytometric analysis. All animal studies were reviewed and approved by the Johns Hopkins University animal care and use committee. An established model of renal IRI was used (9). Animals were anesthetized with 75 mg/kg i.p. sodium pentobarbital. Abdominal incisions were made, and the renal pedicles were bluntly dissected. A microvascular clamp was placed on both renal pedicles for 30 min. During the procedure, animals were kept well hydrated with saline and kept at a constant temperature (∼37°C). After the clamps were removed, the wounds were sutured, and the animals were allowed to recover. At 5 days after ischemia, spleens were collected from donor IRI-operated or sham-operated mice. Splenic cells were collected by centrifugation, and RBC were removed by lysis in NH4Cl for 5 min. Cells were counted, and ∼15 × 106 enriched cells were injected i.v. into nu/nu mice. IRI was induced in the recipient mice 1 wk after transfer (Fig. 1⇓). Blood samples were obtained from the tail vein at 0, 24, 48, and 72 h after ischemia. Serum creatinine (SCr; milligrams per deciliter) was used as a measure of renal function and was assessed with a creatinine 557A kit (Sigma-Aldrich) using an autoanalyzer (Roche). Animals were killed at 72 h after ischemia, and kidneys were harvested. Tissue slices were fixed with 10% formalin and then stained with H&E after paraffin embedding. Tissue sections were scored in a blinded fashion, using a previously described semiquantitative scale designed to evaluate the degree of tubular necrosis (10, 11). Higher scores represent more severe damage; the maximum score is 4: 0, normal kidney; 1, minimal necrosis (<5% involvement); 2, mild necrosis (5–25% involvement); 3, moderate necrosis (25–75% involvement); and 4, severe necrosis (>75% involvement). Myeloperoxidase (MPO) activity, an indicator of neutrophil and macrophage accumulation in tissues, was measured as described by Laight (12). Kidney tissue was homogenized in a solution containing 0.5% (w/v) hexadecyltrimethylammonium bromide dissolved in 50 mM potassium phosphate buffer (pH 6.0) and centrifuged for 30 min at 20,000 × g at 4°C. Samples were incubated at 60°C for 2 h in a water bath, then centrifuged at 4,000 × g for 12 min. The supernatant (40 μl) was incubated with 160 μl of a reaction mixture containing 1.6 mM tetramethylbenzidine and 3 mM H2O2 diluted in 80 mM phosphate buffer (pH 5.4) in a 96-well microplate. The rate of change in absorbance at 630 nm was measured spectrophotometrically, and MPO activity was expressed as absorbance per minute per milligram of wet tissue. To exclude the possible role of contamination by complement or Ig with adoptive transfer from the donor mice, immunofluorescence staining for C3d or IgG was performed on both groups of recipients’ kidneys. Briefly, kidneys were sliced, embedded in OCT compound (Tissue-Tek; Sakura Finetek), and frozen with liquid nitrogen. OCT-embedded frozen kidneys were sectioned at 6-μm thickness, fixed in ice-cold acetone for 20 min, and allowed to air dry for 1 h. Dried sections were immersed in PBS for 5 min, then in serum-free protein block (DakoCytomation) for 20 min at room temperature. A diluted (1/20) FITC-conjugated rabbit anti-human/mouse C3d (DakoUSA) or rabbit anti-human/mouse IgG (1/250) was applied to the sections for 1 h at room temperature. Sections were finally rinsed with PBS and coverslipped using Vectashield with 4′,6-diamido-2-phenylindole hydrochloride (Vector Laboratories) mounting medium. To exclude the likelihood of contamination of hemoglobin (which can alter tissue injury responses) when purifying the donor splenocytes, a hemoglobin assay was performed on the leukocyte suspensions with a QuantiChrom hemoglobin assay kit (DIHB-250; BioAssay Systems) according to the manufacturer’s instructions. 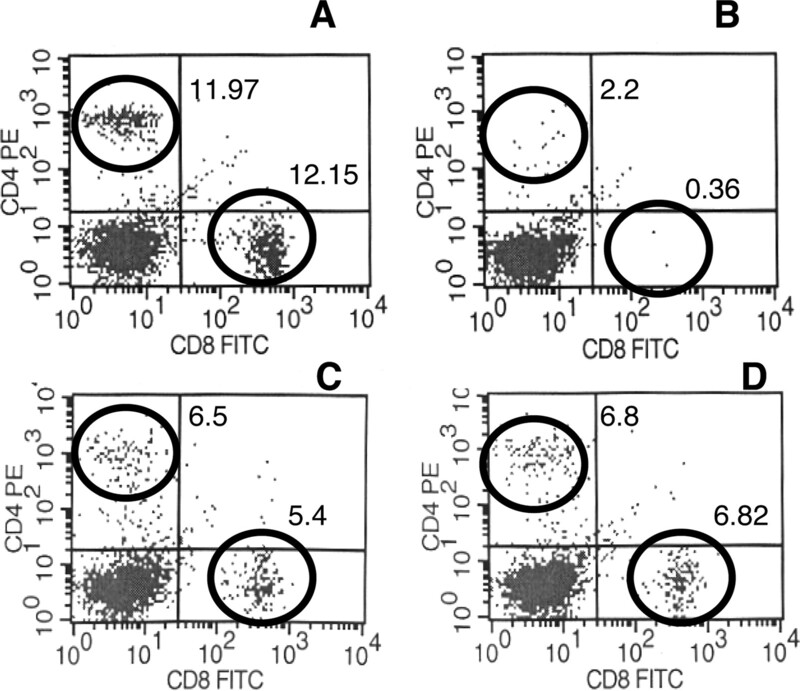 Splenocytes were isolated and stained by two-color flow cytometry (Beckman Coulter) using PE- or FITC-conjugated mAbs CD3, CD4, CD8, and CD19 (BD Pharmingen). A hemocytometer was used to count total cell numbers. Data are expressed as the mean ± SE. Comparison of group means was performed using a one-way ANOVA. A value of p < 0.05 was considered significant. We first sought to establish that we could induce preconditioning in our model of renal IRI. 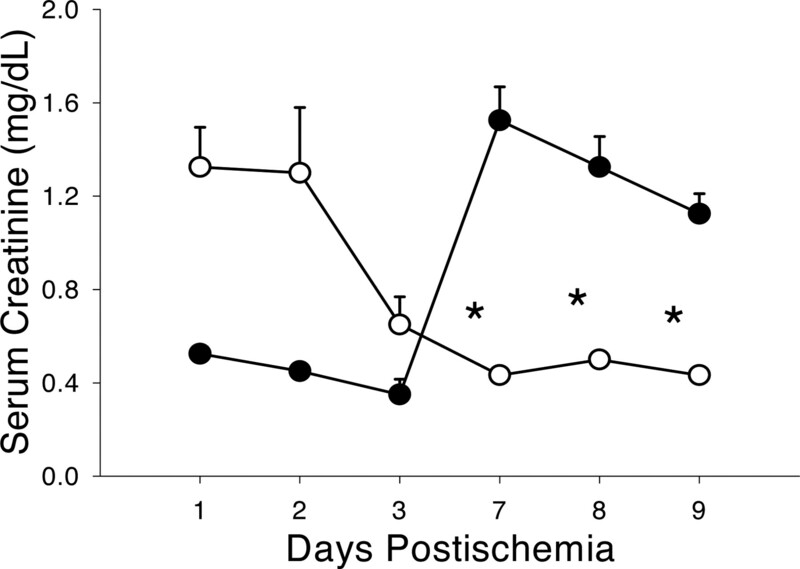 We subjected two groups of mice to either 30-min bilateral renal clamping or sham surgery and followed their SCr for 3 days after ischemia to confirm a rise in creatinine in the ischemic group. On day 6 after ischemia, both groups of mice received 30 min of bilateral renal clamping, and once again their creatinine was followed for 3 days. Fig. 2⇓ shows the SCr levels of both groups. The mice that received an ischemic insult on day 0 had a significant rise in SCr compared with mice that underwent sham surgery. On day 6 both groups of mice underwent renal IRI. The second ischemic event in the IRI group did not produce a rise in creatinine, demonstrating ischemic preconditioning. The mice that underwent an initial sham surgery followed by renal IRI on day 6 showed a significant increase in SCr. Confirmation of IP after a second ischemic event. Mice underwent sham or IRI surgery on day 0. On day 6, both groups of mice (IRI and sham) underwent renal IRI and were followed for 72 h after ischemia. After a second ischemic insult, IRI mice had protection from renal injury with significantly reduced SCr. (•, I/R primed-mice; ○, sham surgery-primed mice. ∗, p < 0.05, n = 4). To test the hypothesis that immune cells directly mediated IP, we took two groups of mice and subjected one group to 30 min renal IRI and one group to sham surgery. Five days after ischemia, splenic cells were harvested, and leukocytes were isolated. We then transferred the same number of cells from both groups i.v. to nu/nu mice. After 1 wk, all recipient mice underwent 30-min renal IRI. 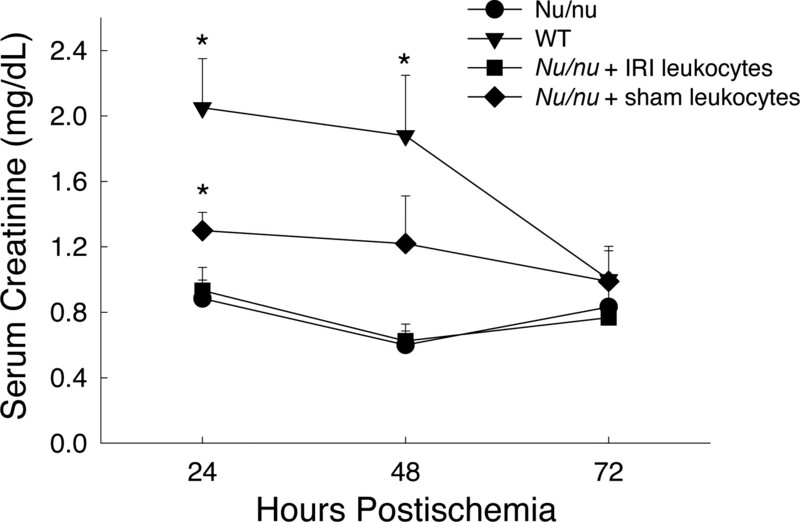 The positive control for the experiment was 30 min IRI in WT mice, which produces a rise in SCr by 24 h after ischemia. The negative control was nu/nu mice as previously described (9), which do not show as much increase in SCr after renal IRI. We demonstrated in this study that nu/nu that receive leukocytes from mice that have undergone an ischemic insult are significantly protected from renal IRI (no rise in SCr) compared with nu/nu mice that receive leukocytes from sham-operated mice, which have a significant rise in SCr 24 h after ischemia (Fig. 3⇓). FACS analysis was used to confirm that both groups of mice received similar numbers of immune cells. Splenocytes from mice from each group were analyzed 72 h after ischemia. These results are presented in Fig. 4⇓ and show that similar amounts of immune cells were transferred into each group of mice. T cell-deficient (nu/nu) mice that received IRI leukocytes had significantly reduced renal injury compared with nu/nu mice that received sham leukocytes. ∗, p < 0.05 vs. nu/nu + IRI leukocytes; WT and nu/nu, positive and negative control. Normal WT levels of CD4 and CD8 are shown in A, and pretransfer levels for nu/nu mice are represented in B (n = 4). Similar numbers of CD4 and CD8 T cell reconstitution occurred in nu/nu mice adoptively transferred with IRI (C) or sham-primed leukocytes (D) 72 h after ischemia. Along with a functional protection from IRI, we found that mice that receive IRI leukocytes before IRI also show marked structural protection. Fig. 5⇓ represents sections of kidneys 72 h after ischemia. WT mice show a typical pattern of tissue injury after ischemia with dilatation of tubules and patchy necrosis. The nu/nu mice, however, show a marked protection from structural injury 72 h after ischemia, as previously demonstrated (9). When IRI leukocytes were transferred before ischemia, nu/nu mice retained their structural protection of injury. However, when sham leukocytes were transferred before ischemia, this protection was abolished, and nu/nu mice showed structural injury more closely resembling that of WT mice. Tubular injury scores were determined and are presented in Fig. 6⇓. The nu/nu mice that received IRI leukocytes before ischemia were significantly protected from renal injury compared with nu/nu mice that received sham leukocytes. Tubular injury scores demonstrate that nu/nu mice that received IRI leukocytes before ischemia have significantly reduced structural injury, compared with nu/nu mice that received sham leukocytes before IRI at 72 h after ischemia. The nu/nu mice had markedly reduced structural injury after ischemia, compared with WT littermate controls, as previously demonstrated (9 ). ∗, p <0.05 vs nu/nu + sham (n = 8). To exclude the possibility of significant contamination of hemoglobin when purifying the donor splenocytes, a hemoglobin assay was performed on the transferring splenocyte suspensions, and minimal hemoglobin was detected in WT sham, WT ischemic, iNOS sham, or iNOS ischemic cell suspension (0.002–0.007 g/dl in cell suspension compared with 0.22g/dl in serum as a positive control). We evaluated the levels of infiltrating neutrophils and macrophages after ischemia as a potential mechanism of immune-mediated IP. Postischemic kidneys were analyzed at 72 h for MPO activity as an indicator of neutrophil and macrophage infiltration. Fig. 7⇓ shows MPO activity for all four groups at 72 h after ischemia. We found no differences in neutrophil and macrophage infiltration between groups. MPO activity at 72 h after ischemia revealed similar amounts of kidney-infiltrating phagocytes in WT, nu/nu, as well as nu/nu mice that received sham or IRI leukocytes before renal IRI (n = 4). To exclude the possibility that the transferred B cells produced Abs to the kidney or the likelihood of contamination of complement with adoptive transfer from donor mice, immunofluorescence staining for C3d or IgG was performed on both groups of recipients’ kidneys, and the results were reviewed blindly by a pathologist (W.M.B.). C3d stained as a discontinuous linear pattern in the tubular basement membrane of nu/nu mice receiving leukocytes from donors undergoing sham treatment or renal ischemia. IgG was minimal in both groups of nu/nu mice receiving sham or ischemic leukocytes, except in some casts (Fig. 8⇓). 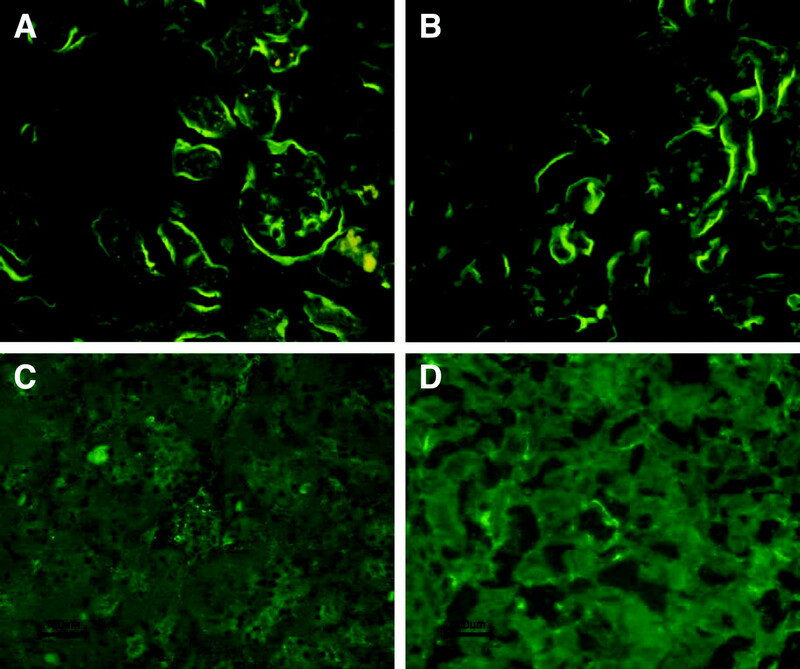 Immunofluorescence staining for C3d (A and B) and IgG (C and D) on kidneys from nu/nu mice receiving leukocytes primed by either sham surgery (A and C) or renal ischemia (B and D). C3d stained nonspecifically with a discontinuous linear pattern in the tubular basement membrane, and IgG staining was minimal in both groups of mice. There was no difference in the low levels of C3d staining between groups. The role of iNOS in preconditioning has been described recently (1). The mechanism proposed was that iNOS works by the generation of NO, which, in turn, attenuates postischemic interactions between leukocytes and endothelium. We therefore investigated whether iNOS was working directly with leukocytes to mediate preconditioning. We transferred ischemia or sham-primed leukocytes from iNOS-deficient mice to nu/nu mice 1 wk before renal IRI. Fig. 9⇓ displays the course of injury in nu/nu mice after transfer of ischemia- or sham surgery-primed leukocytes from iNOS-deficient mice. We found that, similar to IRI in WT mice, iNOS-deficient ischemic leukocytes transferred into nu/nu mice before renal IRI resulted in subsequently reduced renal IRI compared with the nu/nu mice receiving sham surgery-primed leukocytes. These data demonstrate that iNOS deficiency does not abrogate the immune cell’s role in IP. 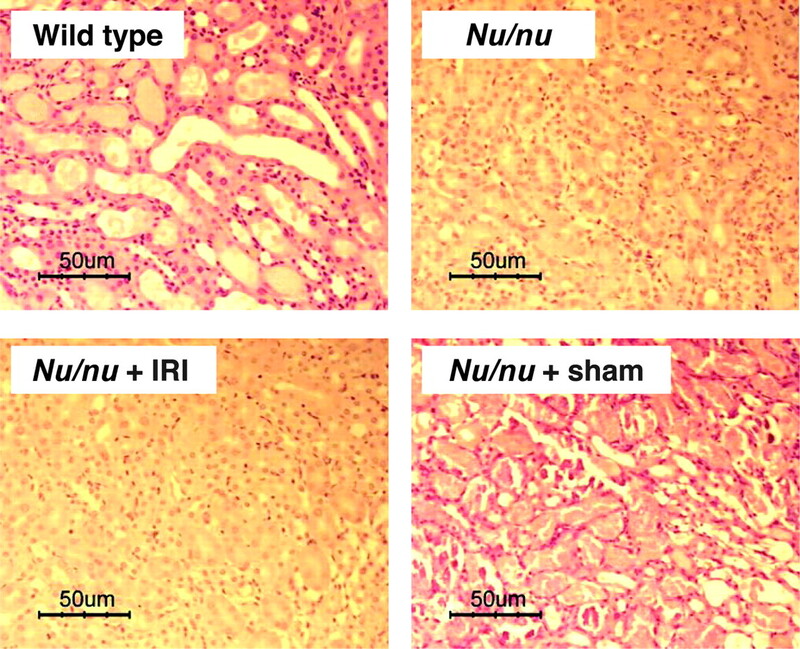 Leukocytes from iNOS-deficient IRI mice transferred into nu/nu mice also resulted in attenuated worsening in kidney function compared with sham-primed leukocytes, similar to that in nu/nu mice that received IRI primed leukocytes from WT mice. ∗, p <0.0001 vs WT or nu/nu + iNOS sham (n = 4–8). The mechanisms underlying IP-mediated renal protection have not fully been elucidated. Most studies have focused on the roles of heat shock proteins (13, 14), endothelin (15), NO (5, 16), and adenosine (3, 17). Because the inflammatory response mediates the injury response to renal IRI (18), we hypothesized that leukocytes also played a role in IP. We found that T cell-deficient mice (nu/nu) that received immune cells from ischemic mice were protected from a rise in serum creatinine and tubular injury compared with nu/nu mice that received immune cells from sham-operated mice. Exposure of immune cells to the milieu of renal IRI thus alters them so as to render them less able to injure the kidney when they are subsequently exposed to a second episode of ischemia. The effects were independent of phagocyte trafficking into postischemic kidney as well as of iNOS. We did not specifically study which population of leukocytes was responsible for protection from injury; however, we limited the complexities between donor and recipient by using T cell-deficient mice as recipients of the leukocyte population. These T cell-deficient mice are athymic and thus produce no mature T cells. They do, however, have a normal population of other leukocytes. We have shown previously that these mice are protected from renal injury (9). To determine a possible mechanism of action, we examined neutrophil and macrophage infiltration into the kidney after ischemia. Kidney samples from each group were analyzed; however, we found no difference in infiltration after ischemia. Because iNOS is an important contributor to the prolonged protective effects of ischemic preconditioning in the mouse kidney (1), we investigated whether leukocyte iNOS could explain our finding that immune cells are important in IP. We demonstrated in this study that when leukocytes from iNOS-deficient ischemic mice were transferred into T cell-deficient mice, a response similar to that of WT ischemic leukocytes was seen compared with those leukocytes from sham surgery, iNOS-deficient or WT mice. Therefore, it appears that iNOS is not involved with an immune cell-mediated IP. To exclude other, more conventional mechanisms of ischemic preconditioning, we stained the kidneys from nu/nu mice receiving either ischemic or sham surgery leukocytes with IgG or/and C3d to determine whether the protected kidneys contain Abs and/or complement. Little IgG Ab or complement was detected in either group of recipient kidneys. Because hemoglobin from lysed erythrocytes could affect IP, we measured the hemoglobin levels in these transferred cell preparations and did not detect significant hemoglobin contaminations. These data demonstrate that circulating Ab or complement is less likely to mediate the ischemia-primed leukocyte protective effect. Several recent studies have focused on the use of IP in a remote organ to protect another organ against later, extended ischemia. Attenuation of lung IRI damage in a porcine model of lung IRI could be achieved by brief, repeated phases of sublethal ischemia to the hind limb skeletal muscle (19). The results showed that functional characteristics of lung IRI were completely reversed; however, the brief ischemia to the hind limb was not sufficient to completely ameliorate the systemic inflammation. These findings are in agreement with our findings showing that neutrophil and macrophage infiltrations were not different in the protected and unprotected groups. This hind limb ischemia study did not elucidate the mechanism of this systemic preconditioning; however, in our study we found that circulating immune cells are able to mediate, in part, the kidney IP response. Another study that supported the concept of immune cell-mediated IP demonstrated that adoptive transfer of splenocytes from E-selectin-tolerized rats to normal rats resulted in protection from injury in a rat model of ischemic brain injury (20). Our current study found that a similar response occurs with the transfer of ischemia-exposed leukocytes. In conclusion, this is the first evidence that an immune cell distant from the kidney can directly mediate IP in the kidney. This finding may also be relevant for elucidating the mechanisms underlying cross-talk between injured kidney and distant organs. Identifying the specific leukocyte population as well as the pathways that mediate IP could lead to novel therapies for IRI. We acknowledge the expert technical assistance of Karen Talbot-Fox with immunofluorescence staining. ↵1 This work was supported by National Institutes of Health Grant R01 DK54770 (to H.R. ), a National Kidney Foundation/Bristol Myers Squibb Young Investigator Award (to M.J.B.-T.), and by NHLBIP50HL073944 (to H.R. and M.L.). ↵3 Abbreviations used in this paper: IP, ischemic preconditioning; iNOS, inducible NO synthase; IRI, ischemia reperfusion injury; MPO, myeloperoxidase; SCr, serum creatinine; WT, wild type. Park, K. M., J. Y. Byun, C. Kramers, J. I. Kim, P. L. Huang, J. V. Bonventre. 2003. Inducible nitric-oxide synthase is an important contributor to prolonged protective effects of ischemic preconditioning in the mouse kidney. J. Biol. Chem. 278: 27256-27266. Murry, C. E., T. Bartosek, C. M. Giachelli, C. E. Alpers, S. M. Schwartz. 1996. Platelet-derived growth factor-A mRNA expression in fetal, normal adult, and atherosclerotic human aortas: analysis by competitive polymerase chain reaction. Circulation 93: 1095-1106. Lee, H. T., C. W. Emala. 2000. Protective effects of renal ischemic preconditioning and adenosine pretreatment: role of A1 and A3 receptors. Am. J. Physiol. 278: F380-F387. Okusa, M. D., J. Linden, L. Huang, J. M. Rieger, T. L. Macdonald, L. P. Huynh. 2000. A2A adenosine receptor-mediated inhibition of renal injury and neutrophil adhesion. Am. J. Physiol. 279: F809-F818. Ogawa, T., A. K. Nussler, E. Tuzuner, P. Neuhaus, M. Kaminishi, Y. Mimura, H. G. Beger. 2001. Contribution of nitric oxide to the protective effects of ischemic preconditioning in ischemia-reperfused rat kidneys. J. Lab. Clin. Med. 138: 50-58. Linas, S., D. Whittenburg, J. E. Repine. 1997. Nitric oxide prevents neutrophil-mediated acute renal failure. Am. J. Physiol. 272: F48-F54. Friedewald, J. J., H. Rabb. 2004. Inflammatory cells in ischemic acute renal failure. Kidney Int. 66: 486-491. Park, K. M., A. Chen, J. V. Bonventre. 2001. Prevention of kidney ischemia/reperfusion-induced functional injury and JNK, p38, and MAPK kinase activation by remote ischemic pretreatment. J. Biol. Chem. 276: 11870-11876. Burne, M. J., F. Daniels, A. El Ghandour, S. Mauiyyedi, R. B. Colvin, M. P. O’Donnell, H. Rabb. 2001. Identification of the CD4+ T cell as a major pathogenic factor in ischemic acute renal failure. J. Clin. Invest. 108: 1283-1290. Rabb, H., C. C. Mendiola, J. Dietz, S. Saba, T. B. Issekutz, F. Abanilla, J. V. Bonventre, G. Ramirez. 1994. Role of CD11a and CD11b in ischemic acute renal failure in rats. Am. J. Physiol. 267: F1052-F1058. Rabb, H., G. Ramirez, S. R. Saba, D. Reynolds, J. Xu, R. Flavell, S. Antonia. 1996. 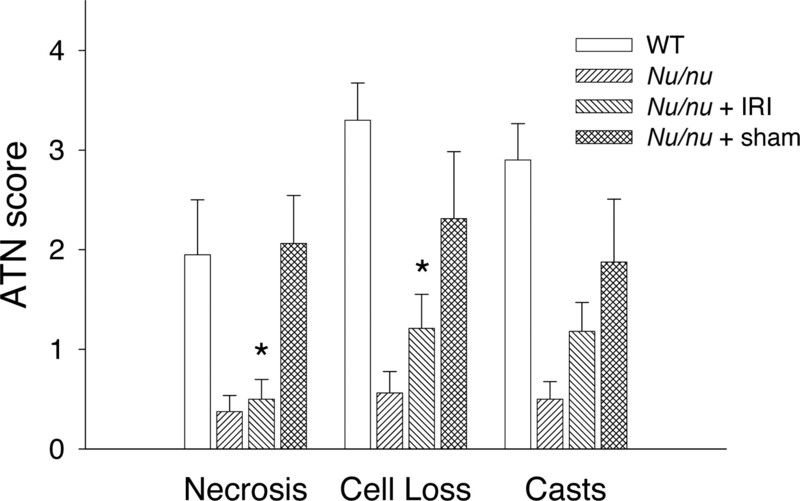 Renal ischemic-reperfusion injury in L-selectin deficient mice. Am. J. Physiol. 271: F408-F413. Laight, D. W., N. Lad, B. Woodward, J. F. Waterfall. 1994. Assessment of myeloperoxidase activity in renal tissue after ischemia/reperfusion. Eur. J. Pharmacol. 292: 81-88. Yang, C. W., C. Li, J. Y. Jung, S. J. Shin, B. S. Choi, S. W. Lim, B. K. Sun, Y. S. Kim, J. Kim, Y. S. Chang, et al 2003. Preconditioning with erythropoietin protects against subsequent ischemia-reperfusion injury in rat kidney. FASEB J. 17: 1754-1755. Yang, C. W., H. J. Ahn, H. J. Han, W. Y. Kim, C. Li, M. J. Shin, S. K. Kim, J. H. Park, Y. S. Kim, I. S. Moon, et al 2001. Pharmacological preconditioning with low-dose cyclosporine or FK506 reduces subsequent ischemia/reperfusion injury in rat kidney. Transplantation 72: 1753-1759. Yamashita, J., M. Ogata, M. Itoh, H. Yamasowa, Y. Shimeda, M. Takaoka, Y. Matsumura. 2003. Role of nitric oxide in the renal protective effects of ischemic preconditioning. J. Cardiovasc. Pharmacol. 42: 419-427. Yamasowa, H., S. Shimizu, T. Inoue, M. Takaoka, Y. Matsumura. 2005. Endothelial nitric oxide contributes to the renal protective effects of ischemic preconditioning. J. Pharmacol. Exp. Ther. 312: 153-159. Lee, H. T., C. W. Emala. 2002. Preconditioning and adenosine protect human proximal tubule cells in an in vitro model of ischemic injury. J. Am. Soc. Nephrol. 13: 2753-2761. Burne-Taney, M. J., H. Rabb. 2003. The role of adhesion molecules and T cells in ischemic renal injury. Curr. Opin. Nephrol. Hypertens. 12: 85-90. Waldow, T., K. Alexiou, W. Witt, S. Albrecht, F. Wagner, M. Knaut, K. Matschke. 2005. Protection against acute porcine lung ischemia/reperfusion injury by systemic preconditioning via hind limb ischemia. Transplant. Int. 18: 198-205. Chen, Y., C. Ruetzler, S. Pandipati, M. Spatz, R. M. McCarron, K. Becker, J. M. Hallenbeck. 2003. Mucosal tolerance to E-selectin provides cell-mediated protection against ischemic brain injury. Proc. Natl. Acad. Sci. USA 100: 15107-15112.